Despite their running times, all of the Live Action Shorts function in the same way that a well-crafted short story does, as a complete and satisfying narrative that touches on some truth of the human condition. Many first time actors appear, and prove again, like Quvenzhané Wallis and Dwight Henry in Beasts of the Southern Wild, that talent is everywhere. They give the lie to Hollywood's deification of American actors. The Oscar website does little by way of providing information about these films beyond the directors' names and where they were filmed. I've tried to do a bit of research to tell a little something more about them. Shot in Paternoster just outside Cape Town, South Africa, and cast with Somali refugees, Bryan Buckley and Mino Jarjoura's Asad is the story of a boy's coming of age in war-torn Somalia, where the lure of piracy seems preferable to tuna fishing. The captivating boys who play Asad and Mohammed “had just come to South Africa from Somalia,” Buckley said in an interview. “They had never been to school; they didn’t have that opportunity in Somalia. When they came here, they were basically illiterate but they memorised the whole script, start to finish. They had never been in the water before, so they had to take swimming lessons too.” After filming, Buckley and his associate producer Matt Lefebvre managed to get the boys into a school. Since March, “They’ve gone from illiterate and unable to speak English to third grade," Buckley said. Source: Kevin Likes whose clients include, among others, Al Jazeera English and F.I.L.M. Another coming of age story is Sam French's Buzkashi Boys set in Afghanistan. 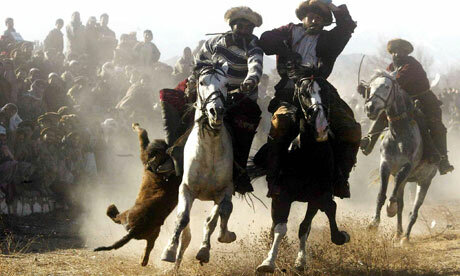 Buzkashi is the national sport of Afghanistan in which the goal is to grab a headless carcass of a goat, from whichever rider has it in his possession, in a thunder of galloping horses. The game may continue for days. The boys are a street smart orphan beggar and the son of a poor though proud blacksmith whom he has befriended. The street kid is enamored of buzkashi and wishes to share his passion with the blacksmith's son. He has a dream of becoming a famous buzkashi rider, and tries to impress upon his friend the faith that he too must have dreams beyond blacksmithing. According to Emma Graham-Harrison's feature article in The Guardian, in a reversal of roles, the beggar is played by Jawanmard Paiz, the youngest in a family of Afghan actors, while the blacksmith's son is played by Fawad Mohammadi, a street urchin "the production team had known for years selling maps and trinkets to foreigners on Chicken Street, a row of stores that is the closest thing Kabul has to a tourist trap." Shawn Christensen's Curfew is a perfectly realized little gem. It centers on the depressed man-child Richie, whose estranged sister calls him one night out of the blue needing someone to watch her nine-year-old daughter Sophia. Surprising even himself, and in spite of Sophia's resistance, Richie wins Sophia over. Richie takes Sophia to a bowling alley and, lightheaded for reasons I will not reveal, watches as a marvelous dance sequence unfolds with Sophia at its center. Sheila O'Malley's review in Capitol New York is a spoiler, if you are so inclined. Rijckx is obsessed with a girl he met the moment before he died. Once among the living he is again an agent of free will and the one responsible for the consequences of his choices. An interview with Tom Van Avermaet appeared in Indiwire. I screened Amour the day before I saw Yan England's tribute to his grandfather, Henry, and the Documentary Shorts the day after, in a film season finale that seemed unusually preoccupied with age. An elderly concert pianist, the eponymous Henry, believes he has lost his wife Maria, not only the love of his life but a violinist with whom he has performed. A poignant portrayal of the confusion that attends the waning of memory. Yan England talks to the Montreal Gazette about his grandfather, on whom his film is based.